With the name like Coffeinne, the music can be serious or a joke, but energy is expected. Spaniards deliver it in spades on the debut Circle of Time. Not supercharged with double bass, the album is rather a more relaxing old school hard rock / heavy metal listen. 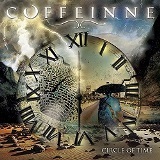 Coffeinne like to deliver muscular riffs in their verses, only to follow up with more flowing melodic hooks come chorus time. The band's guitarist(s) are not afraid to go on extended solo runs, and the voice, even though straining a bit, projects a certain amount of toughness. Whether it is because Coffeinne is a bunch of young guys or it is exactly the intent of the album, but many songs here (Life in a Showcase, No Escape) project a very definitive positive atmosphere, even to the point of naïveté, despite the No Escape title. The voice alternating between softer signing and more showy surface brutality helps with the impression of a naïve youth. From that standpoint the more nu-metal 'core elements of Save Me can be logical, but don't fit in the best of ways. The rest of the material on Circle of Time reminded me in spots of less glammy King Kobra, less proggy Crimson Glory or something along the lines of Austrian Stigmata. Coffeinne do a good job not over polishing their sound, sticking instead with dirtier, more natural and down to the earth delivery. The best moments came in the form of the pulsating Take This Life with its floating chorus, or Broken which has similar verse-chorus contrast. Both of these cuts also have guitars tearing it up and down the fret come solo time. Military martial bent of The Hate Within is interesting as well, whereas the closing title track was a more Rhapsody symphonic take which was alright to close with but is a departure from the rest of the album. A decent album for a debut, especially if you like some unvarnished simpler heavy metal.